Farmed by Kent Waliser and Derek Way, these three vineyards, managed by Sagemoor Farms, are located in Pasco along the Columbia River. 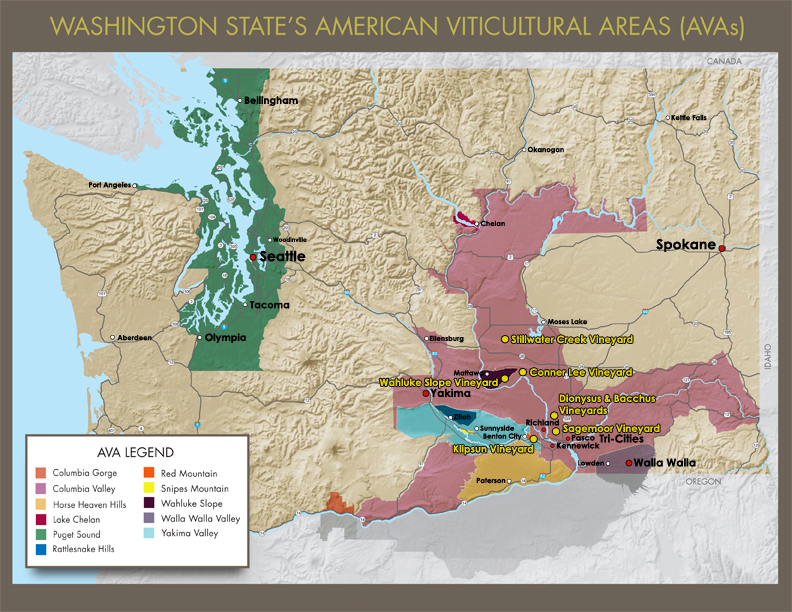 They not only possess some of the oldest vines in Washington state, but they feature beautiful soils, sandy loam, good temperatures and excellent grape acidity which is maintained by the vineyards’ close proximities to the river. Farmed by Tom Thorsen and Jerry Bookwalter, the Conner Lee Vineyard is located just outside of Othello where the prime location, deep sandy soils and cooler temperatures allow the grapes to have a long hang-time which yields very concentrated flavors. Farmed by Ed Kelly, Stillwater Creek Vineyard is a 235-acre site on the Royal Slope of the Frenchman Hills. Planted in 2000 on a steep, south-facing slope with one of the most diverse clone selections in Washington state, Stillwater Creek quickly has earned a reputation as one of the Columbia Valley’s top vineyards. The site’s fractured rock and extreme southern exposure are ideal for reds, especially Cabernet Sauvignon, Merlot and Syrah. , it is best known for its innovative vineyard management and unique selection of premium varietal clones. Farmed by Patricia Gelles, this highly acclaimed vineyard is located in Benton City. Klipsun is a very warm site, but produces good acidity due to the elevation, as well as excellent balance and flavors. Farmed by the Milbrandt Brothers, the Wahluke Slope Vineyard is located in the Wahluke Slope AVA, between Mattawa and Othello and directly south of the Stillwater Creek Vineyard. It was planted in 1980 and has over 150 acres of mostly red fruit such as Cabernet Sauvignon, Merlot, Sangiovese and Syrah. The unique soils, combined with a dry, warm climate have indeed made Wahluke Slope one of the best places in the state for wine grapes. From vineyard to tasting room, wine cellar to dining room, the cycle of life that is winemaking runs deep in the family-oriented operations of Arbor Crest.